“As two young people who had never experienced a pregnancy or birth before, we knew we wanted some support for the arrival of our first child. At first we were not even sure that meant a doula, or that we needed one. We had many interviews with potential people. But after meeting Katharine, we knew we found a unique and open person who would listen to our desires and concerns for this intense and special moment in our lives. Her energy and approach set her apart from everyone else we spoke with and it felt like the missing link we’d been waiting for. She was endlessly available for questions and information in the months before the labor began, and a warm and knowledgeable presence when the show finally started. She seems capable to work within a variety of social styles and familial situations, and also birthing circumstances: she’s done home as well as hospital — and encourages whatever level of medical intervention you feel comfortable with. She was the only person we interviewed who came to the practice without any preconceived notions, ego or judgement. And on a smaller note, her aromatherapy and body work during labor eased some tension in ways I wasn’t even expecting. Would highly recommend her as part of your birthing team, and would be happy to share more thoughts by phone or email if anyone would like to hear more. My husband said that it allowed him to relax and be present in a way that he couldn’t have otherwise — it was like what you want New Years Eve to be, but it never is, in his coded words!” -H.B. 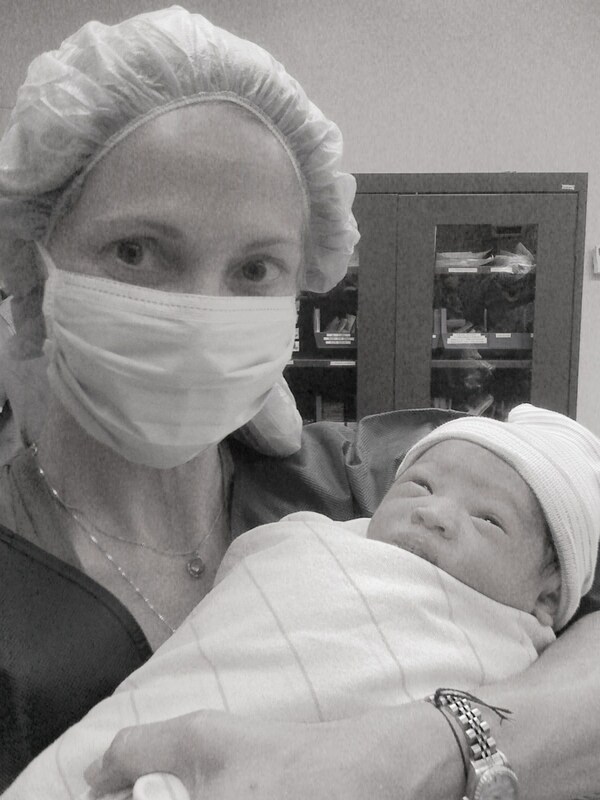 “We feel so blessed to have found Katharine for the birth of our son and third baby. She is warm, loving, understanding, non-judgemental and incredibly helpful on all things birth related but also a wonderful sounding board for all things mother and life related. She provided consistent support through the course of my pregnancy via meet-ups, texts and emails. We found her to be incredibly responsive and willing to give of her time, energy and advice. Her knowledge of the hospital (Cedars) and experience working alongside our OB and the staff at Cedars speaks to her ability to work harmoniously with everyone and makes for a calm and warm atmosphere. She was attentive and caring through the hours of labor, came prepped with oils and strong hands for squeezing! I truly feel that my birth was significantly better and more positive with her involved, and frankly would have more babies just to have her around! We value her service as a doula but also consider a friend and part of our family as she helped us usher in our baby boy. Thank you, Katharine! !” —Sarah M.
We love Katharine like a member of our family. Having her at our birth was 1 of the best decisions we ever made. K was with us in labor 2 separate times for the same birth. She was incredible throughout the turn of events. After reporting excessive itchiness at 37wks, my midwives suspected I had Cholestasis. We had to proceed with an immediate induction. I had been preparing for an unmedicated birth. K helped us navigate the physical & emotional complexities of our situation. The cervical exams were excruciating. I became consumed w/ self-doubt. How was I going to be able to do this w/o an epidural if I can’t even handle a cervical check? I felt defeated, my confidence in my body was shot. I was an emotional wreck it hadn’t even been 24 hrs. K met us at the hospital to help us settle in. She diffused EO’s, she massaged my feet & stayed until bed. She was there for me when my self confidence disappeared. Her touch was firm yet comforting. I really needed her there and she was. She already knew the midwives and L&D nurses. She anticipated everything before it happened. K helped me refocus & accept my new reality. On the 3rd day the next steps were: epidural+foley+pitocin. Right before the epi, blood work came back negative. We’re told we could go home. “There’s no way I’m leaving w/o baby” I thought. K helped us make an informed decision based on science & not emotions. We went home. If we kept going my baby would have likely been born via emergency C. My water broke 3 wks later & baby was born vaginally. K is incredible in every way. She taught me there is no right or wrong way to birth. The right way is whatever the right choice is for your individual self. It’s about achieving your best birth, may that be w/ or w/o an epidural, home or hospital, or anything between. Your doula should embrace your choices and help you achieve the best version of it. The right birth is an empowered birth. That’s exactly what Katharine did for us. -Sarah K.